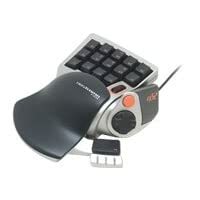 Nostromo SpeedPad n52 Developer: Belkin Part #: F8GFPC100 Price: 25-30$ Requirements- * Windows 98 SE/ME/2000/XP or Mac OS X/OS 9.X * USB Port * CD-ROM Features- * 14 Keys * 1 Fire Button * 1 Scroll and Click Mouse Wheel * 1 Space Bar Button * 8 Way Directional Pad * Everything you can press or scroll is programmable. * Easy to use software for programming and key customization. * Normal setting + 3 more setting shifts, giving you 108 key functions in total. * Ability to link configuration profiles to certain games. I could make 1 key that would flip to my 4th hotbar, switch my weapon, activate the 6th skill on that bar, say a text macro in group chat, flip back to my 1st hotbar, and then equip my original weapon. I could hit 1 key and it would give various voice commands that could explain my entire scouting situation. I could hit 1 key that would target every toon of a certain unit type, have the units switch to the same ability, and then target the Hero for a massive focus fire. Setting up my keys to work with the configuration and form of the n52 worked well. I used the directional pad as my setting shifter and then set up my keys to work with the shifts. I used the 4 arrowed keys on the main key pad (with compliments of my mouse) to navigate my characters. I was able to organize it very well with the availability of 3 shifts. If I had a single target lightning nuke on the first key, when I went to my 1st shift, on that same key I would have an AoE lightning nuke. The 2nd shift, on that same key, I would have a PBAoE lightning nuke and so on. Other then the awkwardness of getting used to handling an n52, there were a few other problems. The n52 is not wireless and it can only be used in your left hand. There is a feature that you can have a certain key perform over and over till you hit it again. While this does work, if you hit it again while it\'s running through the macro, it won\'t stop till it\'s finished going through that particular macro run. If you hit it again thinking \'why hasn\'t it stopped yet?\', you will bug it and it won\'t stop till you unplug it and plug it back in. The average non-mainstream reseller will sell the n52 at around 25-30$. Mainstream retailers, like CompUSA will sell them for 40$ and Belkin sells them at 50$. So I suggest getting your n52 from someone not as popular. With all the key configuration possibilities and organization, my game got an overhaul that I didn\'t even know I needed. I could command troops faster, move and control my actions smoother, and fight more effectively then if I were using a standard keyboard. It\'s as if I now had 2-3 keyboards in the palm of my hand. Now that I have an n52, the only time I use my standard keyboard is to chat with the people who don\'t use TeamSpeak or Ventrillo. This is the one the few products I feel I\'ve gotten more then my penny\'s worth and I highly recommend it.